Twenty-seventeen brought our family many blessings and a few surprises. And sometimes I even surprised myself. We spent most of 2017 dogsitting for my son who was deployed overseas. Boomer had visited us before and crawled into our hearts. Ten months of 24/7 dog supervision turned me into a dog person. My kids all recognized the signs. A couple of them even suggested that we get our own dog. One of them became pro-active. He showed up at my door one day and said he wanted to show me a picture of our Christmas present. He pulled a picture up on his phone. I was hooked. But someone else moved more quickly and claimed that pup. So my son found another–and I became just as quickly hooked on this one. My husband is the true dog person–a dog whisperer. Remember, kids and dogs can always sense the true nature of a person. If dogs don’t like someone, take it as a sign. All dogs love Paul. And this dog seems to love everyone. So getting a dog was something we did this year, and it was not something I would have suspected I would do a year ago. I surprised myself another way this year–much to my daughter’s delight. She is a tattoo aficionado. I have never been a fan. Then I saw a photo that haunted me. 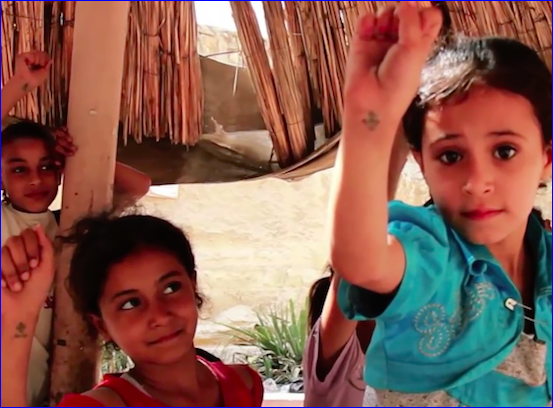 These children are Egyptian Coptic Christians. Their tattoos are a mark of their faith, not a fashion statement. They are my brothers and sisters in Christ who live with the threat of persecution daily. And their faith is tested even while they are so young. I wanted to identify myself with their suffering. My “conviction” against tattoos vaporized in an instant. My daughter and I went together and both now carry the same sign of our faith. “Never say never,” a wise aunt once told me. 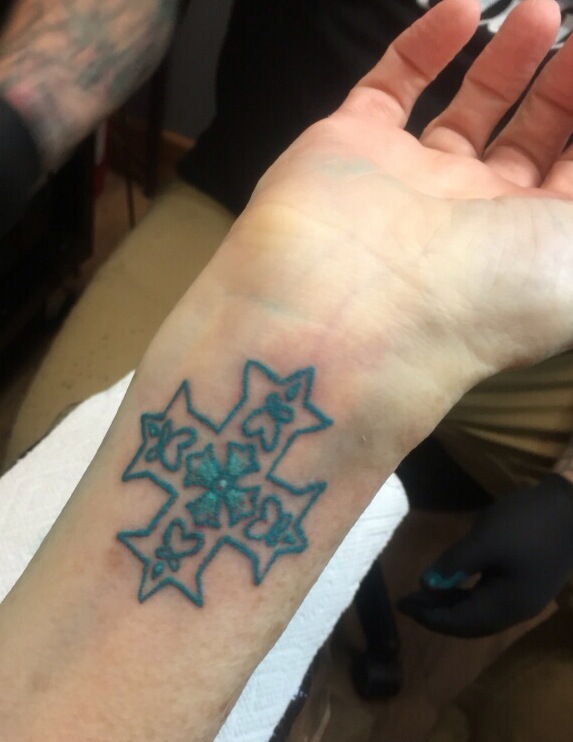 Stick to moral imperatives, but leave room for dogs and tattoos. You never know what you might do this next year. You may even surprise yourself. God’s richest blessings to you and yours in 2018. Love the dog. Not so much the tattoo. But love the dog. As far as dogs knowing the true nature of humans I need to point out that Adolf Hitler’s dog loved him. Hmmmm. I don’t want to go against history here so I have to disagree with you. Dogs love their keepers; the ones who feed them and keep them warm in winter. Character has little to do with it. Even Paul would find a canine friend if he showed love and a propensity to feed him. In Paul’s case, however, the character issue is a well warranted plus. Merry Christmas an Happy New Year! Yes, you can fool the occasional dog–just as Hitler manipulated the German people. Stalin had a theory about people feeding chickens. But if a dog doesn’t know you from Adam–and likes you anyway–it’s still a good sign. Christians are persecuted and abused in Pakistan and in many other countries. The ISIS wars in Iraq and Syria were wars on the local Christians in those countries. The Christians of the Nineveh Plains (in northern Iraq) are now starting to return to try and rebuild their homes and their communities.